Little seems to be publicly known about Black history in Canada, aside from the story of Canada as the northern terminus for the fabled Underground Railroad. For example, the fact that Canada actually had slavery seems to be a part of our historical narrative that has largely been forgotten, or even buried. The fact that Canada had racial segregation and that African Canadians fought for their civil rights is another part of the only-hazily-remembered past. Perhaps because of our history as a part of colonial Britain or as the northern neighbour of the United States, Black history in this country is very complicated, and also very interesting. Nova Scotian Rose Fortune is a good example of someone who led an interesting life. 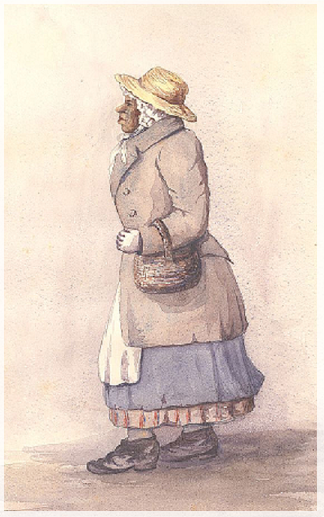 Born in Virginia in 1774, she was brought by her slave parents as Black United Empire Loyalists to Nova Scotia, where they settled as free people in the Annapolis Valley. Rose grew up to be an entrepreneur. She ran a cartage business, as well as a business providing wake-up calls at local hotels for passengers on departing ships. Her work in the area of the docks led to her take on a role as an enforcer of curfews – a role that made later generations designate her as the first policewoman in Canada. She lived into her 90s, but her grandchildren carried on the business she founded for another 100 years. More recently a scholarship in law enforcement was named in her honour, and one of her descendants became the first Black mayor in North America. Note: Rights and Permissions for images on this website are limited to this site only. Viewers wishing to copy any of the images on this site must seek their own permissions. To quote the narrative content on this site use the following citation: Smith, Allison. Black History in Canada. http://blackhistoryincanada.ca/exhibits/show/black-history-in-canada (accessed <insert date>).